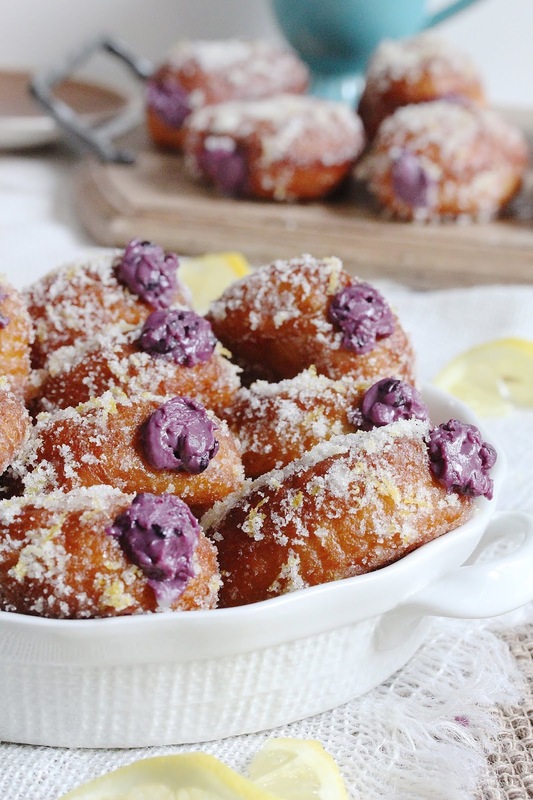 These donuts with sweetened blueberry goat cheese and coated with lemon sugar are as good as they look! Serve with a cup of coffee or drink of choice, they are a delightful breakfast or snack time treat. 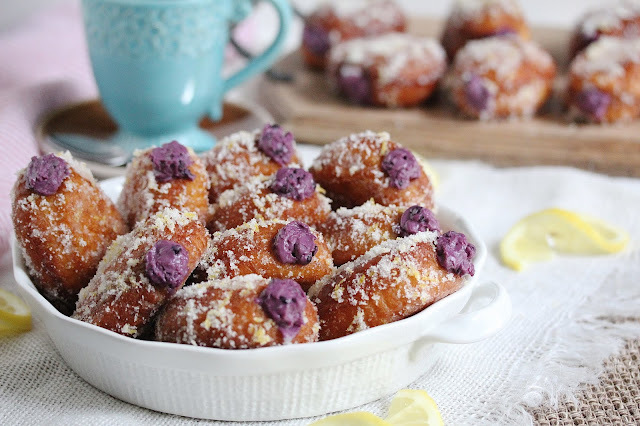 I have never made yeast donuts before, but after having tried it, I am adding them to my baking repertoire. They require a little bit of effort, but the results are so worth it! 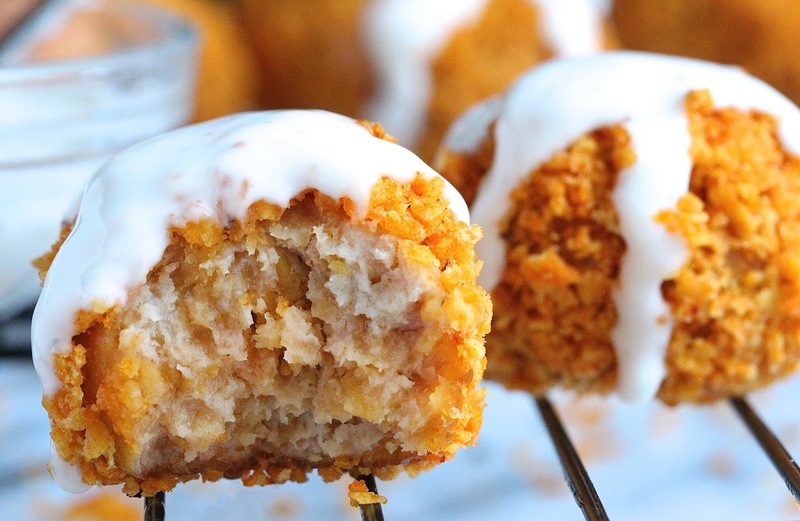 After trying out a couple of donut recipes, the one from The Pioneer Woman is a clear-cut winner. The donuts are so light, fluffy, and tender! And it's Ree's dough recipe that I used as the base for these scrumptious, goat cheese and blueberry filled donuts. 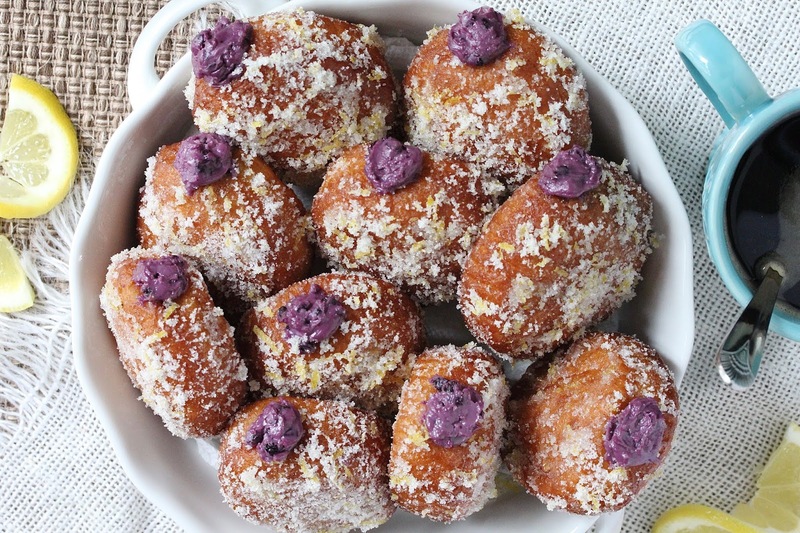 Even if you're not a goat cheese lover, you are going to like these donuts. Although I'll eat goat cheese, it is not one of my favorite cheeses. Imagine how delicious it is when I tell you I can eat this filling by the spoonful. The fresh summary taste of blueberries and the sweetness of powdered sugar tone down the cheese's distinctive earthy, musty flavor. It becomes a sweet, mild, and delicious dessert cheese. Not to be outdone by what's going on inside of the donuts, the outside is just as irresistible. I don't know about you, but when you add a coating of crunchy sweet sugar to the outside of anything, it's a total endorphin releaser. It makes my eyeballs roll to the top of my head, in a good way! With the addition of lemon zest, the sweetness and tanginess on the outside perfectly compliments the sweetness and tanginess of the cheese filling inside. This donut recipe requires a little bit of planning beforehand as the dough needs to rest for at least 8 hours...better yet, overnight. I actually love working with yeast. The transformation from a firm ball of dough to a light and airy mass of gorgeousness at the end of the proofing never ceases to amaze me (life's simple pleasures ♥︎). Yeast is the magical ingredient for the dough. It releases carbon dioxide during the proofing process, which enables the dough to rise. When working with yeast, the most important things to keep in mind are its freshness and the temperature of the liquid used. The yeast is activated in a bowl of warm milk and sugar at 105°-115° F temperature. Too high of a temperature will kill the yeast. If the yeast does not expand and becomes foamy in the milk, it is no good. Time to get new yeast. The recipe is designed for stand mixer, which does all of the kneading. It's my option of choice when working with yeast. I don't have to put in the elbow grease. If you don't have a stand mixer, or prefer not to use one, just knead by hand on a lightly floured surface. 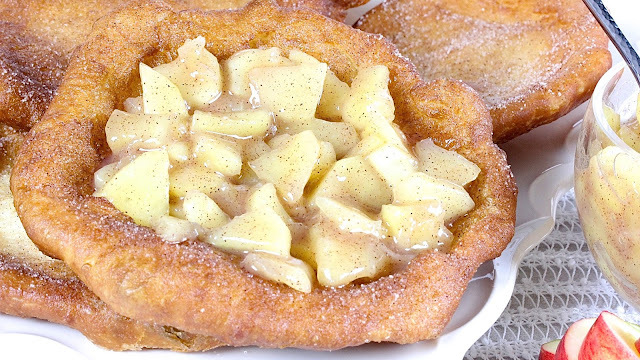 As with all donuts, these are best served immediately. But I have stored them refrigerated for a couple days and they are still scrumptious. The donuts firm up from refrigeration. Microwave them for a few seconds before serving. It restores the tenderness. I hope you'll try these, especially if goat cheese isn't on the top of your favorite cheese list. You will probably be tempted to eat it off the spoon too!! Heat milk until warm but not scalding hot, about 105° F. Stir in sugar to dissolve. Place yeast into a small mixing bowl. Pour milk mixture over yeast, stirring gently. Set aside for 10 minutes. Yeast will become foamy during this time period. Combine flour and salt in a bowl. Set aside. Add butter to the bottom of the mixing bowl of a stand mixer. Beat in eggs using a fork. Fit mixer with a dough hook. Add milk/yeast mixture into the mixing bowl. Beat on speed 3 (or medium low) for a couple minutes to combine. With the mixer on, add 1/4-1/2 cup increments of the flour mixture, allowing a few seconds of mixing to incorporate in between each addition. Continue this process until all the flour is gone. Scrape the bottom of the bowl. Continue beating on medium low for 8-10 minutes. There will be a pool of dough at the bottom, but the dough should pull away from the side of the bowl. Dough should be slightly tacky when done. Shut off mixer. Scrape the bottom of the bowl. All to sit for 10 minutes to rest. Transfer dough to a lightly oil large bowl. Toss to coat dough with oil. Cover with plastic wrap. Refrigerate for 8 hours or overnight. Remove dough from the fridge. Roll out to 1/4-1/3 inch thickness on a lightly floured surface. Cut out rounds using a 3-inch donut or biscuit cutter. Place on a floured baking sheet. Gather up scrap. Re-roll and cut out rounds. Cover with a large tea towel. Allow to rest for 1 to 1 1/4 hour in a warm, draft-free spot. The dough should rise and become puffy and airy. Before frying, prep the sugar coating: add lemon to sugar in a small bowl. Thoroughly combine. Line a large baking sheet with several layers of paper towels. Line a large cooling rack with parchment paper. Preheat 1 1/2 to 2-inches oil to 365° F in a medium pan. Place 2 rounds into the hot oil. Cook until light brown, turning over half way. Total cooking time, about 1 1/2 minutes. Adjust heat accordingly if browning too quickly or slowly. Remove donuts from oil with a slotted spoon. Place on the paper towel lined baking sheet. Turn over donuts over a couple times to blot dry. Poke a hole on the side of the donut using a large skewer (or the tip of a wooden spoon). Use the skewer or spoon to hollow out a cavity. 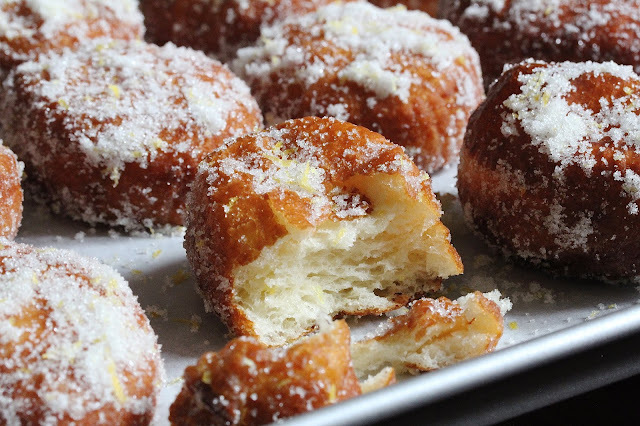 Coat donut one at a time with the lemon sugar. Use hands to gently rub the sugar onto donut. Avoid putting sugar in the cavity. Place the donut on the parchment lined cooling rack. Repeat frying and sugar coating the remaining donuts. Allow donuts to cool at least 30 minutes and for the sugar coating to set before filling with the goat cheese mixture. To make the filling: Cut cheese into large chunks. Microwave for a few seconds to soften. Stir in milk. Gradually add powdered sugar. Stir until creamy and smooth. Microwave for a few seconds if necessary to obtain a spreadable consistency. Transfer the filling to a piping bag with a medium to large round tip, or use a plastic storage bag with a tip cut off. 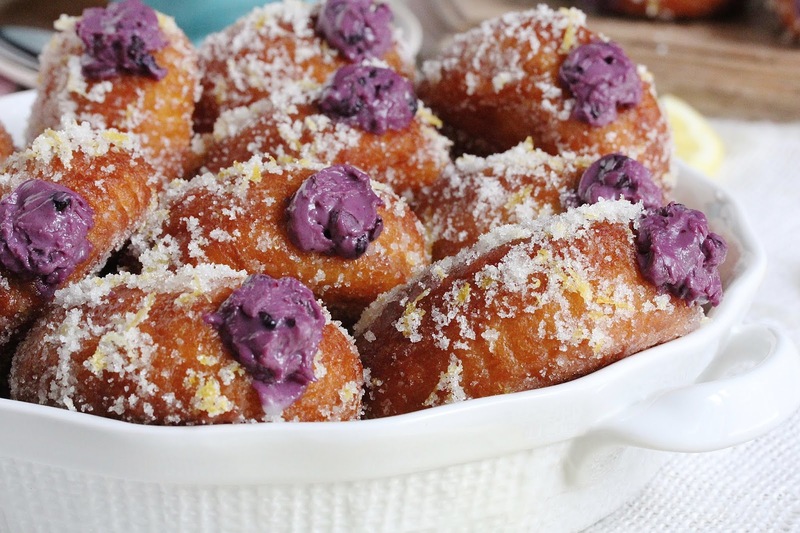 Gently squeeze about 1 heaping tablespoon filling into each donut. Best served immediately. Can be stored refrigerated in an airtight container. Donuts firm up when chilled. Microwave for 8-10 seconds before serving. To provide a warm environment for the dough to rise: turn oven on its lowest setting for about 70-90 seconds to obtain about 90° F. Immediately shut off heat. Place dough in oven. Test donuts are the best. Such GORGEOUS photos, Thao! That filling! I do happen to love goat cheese, so there's no question I'd be all over these. 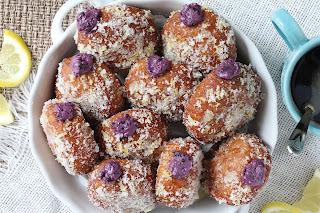 I've never tried my hand at yeast donuts but I"m thinking they'd make such a great little treat for my family! Thank you Katherine! I think the fact that donuts are one of the easier foods to photograph helps.😉 I think yeast donuts are worth a try. Your family will thank you for it! Absolutely amazing looking donuts. 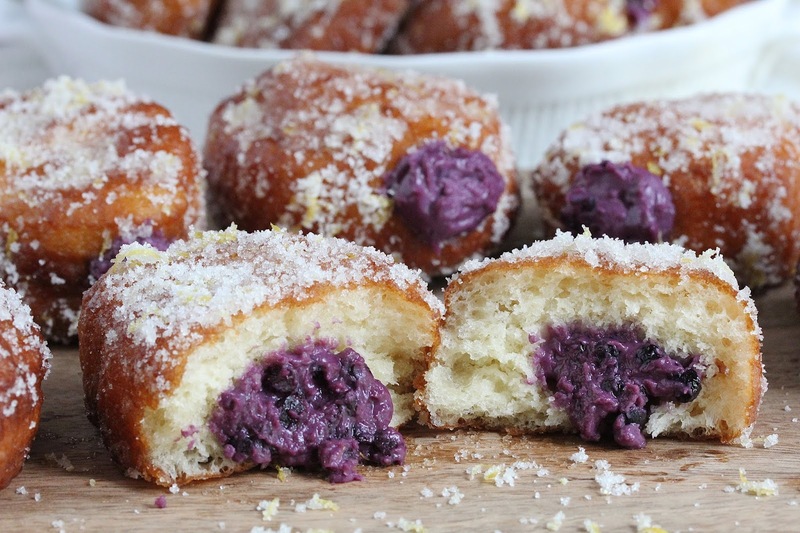 I don't make donuts often myself, but I would definitely make these. The filling sounds delicious, I love goat cheese. Thank you Adina! 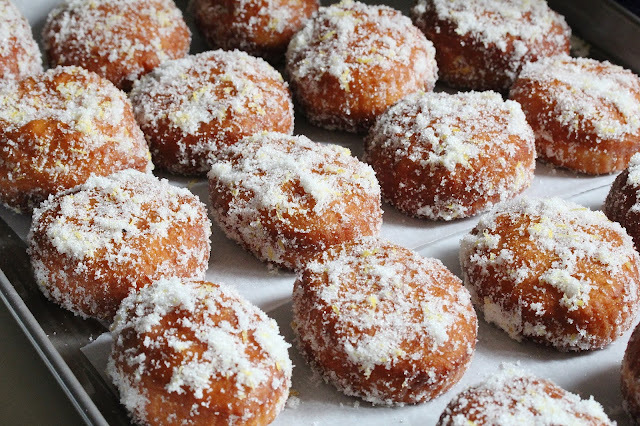 Fried donuts are definitely an occasional treat kind of food, but they are so worth making, especially if you love goat cheese! Thank you Inger! I'm so glad you're pinning it. They are worth all the calories!